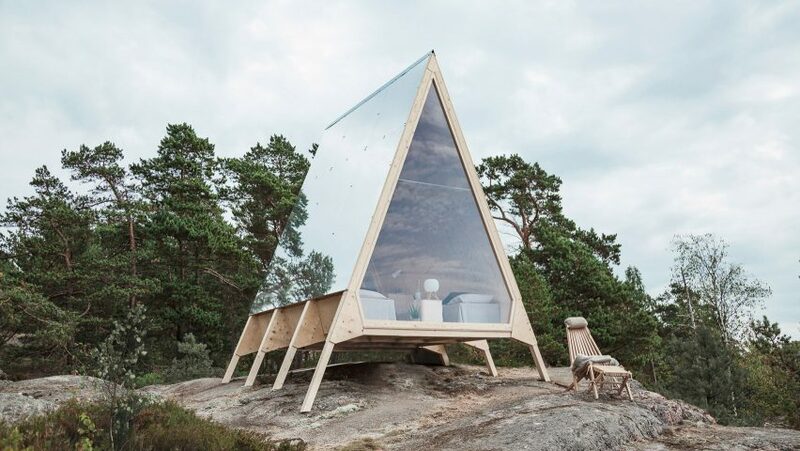 Finnish designer Robin Falck has created an A-frame mirrored holiday home on Vallisaari, an island near Helsinki. Named Nolla after the Finnish word for zero, the mobile cabin is built with sustainable materials – local pine and plywood – and is designed to allow visitors to have a zero-emissions holiday. The size of a small bedroom, Nolla is built from A-frames with a glass front to give guests a direct view its surroundings. It is created using cradle-to-cradle design principles. "Having a smaller house it automatically forces you to bring less stuff there and also bearing in mind that whatever you carry with you, you will have to carry with you when you leave," expained Falck. The cabin can be transported and assembled without the need for heavy machinery. No screws are used in the assembly, instead the cabin is pieced together like a puzzle. "The pedestals are adjustable, so that the cabin can adapt to different kinds of terrain. In essence, there are no special parts used in building it – a replica of any part can be made from scratch by anyone, all they need is timber," explained Falck. The A-frame shape was also chosen to add to the ease of moving the cabin from location to location. It is also reminiscent of a tent to encourage users to think about their stay as if they were camping, and to consider carefully what they carry with them. "I wanted to achieve the same light effects that you get when you open the zipper of your tent as you wake up in the morning. Once direction, pointing towards the most beautiful view," said Falck. The design excludes most modern commodities, focusing instead on self-sufficiency and low-impact living. As per Nordic tradition there is no indoor bathroom – any washroom needs are taken care of in an outhouse. Energy supply for the Nolla cabin is entirely renewable; electricity is generated by solar panels and the stove runs on renewable diesel made from 100 per cent waste and residue. The boat that runs between Vallisaari, where the cabin is located, and Helsinki city centre also runs off the same renewable diesel. The low-carbon biofuel was developed by Finnish renewable energy company Neste, who commissioned the build of the cabin. "Finns are known for spending time at their summer houses," said Sirpa Tuomi, marketing director at Neste. The Nolla cabin is being rented via Airbnb, but is currently fully booked. It is the second micro-home created by Falck. The first, named Nido, was created by the designer for his personal use. Earlier this year BIG created a prototype micro-home in Upstate New York , while Invisible Studio created a cabin in the UK made entirely from salvaged materials and locally grown timber.